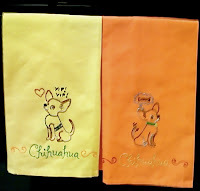 My mom made me these vintage looking kitchen towels. We got the pattern from Sublime Stitching in Austin Texas. They have AWESOME patterns! My mom usually does only redwork but when I saw these patterns they looked just like Benjamin and I could not resist ordering them. She surprised me with the towels the other day. My kitchen walls are bicycle yellow so they match perfectly. She did a great job! 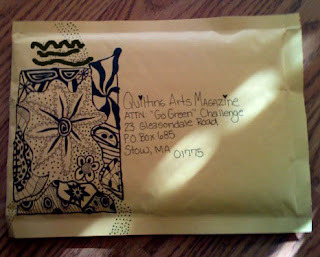 I love Quilting Arts Magazine and read each issue over and over and over again! Each year I issue a new challenge to myself. This year it is to focus on “RePurposing” found items and make eco-friendly art. So when I read about the “Go Green!” challenge, I just had to enter. The base and backing of my square is made from an antique hand embroidered pillowcase. The batting is recycled dryer lint and the stabilizer to support the beading and embellishments is a recycled fabric softener sheet. I typed words that are important to me, printed them out, and stamped them with different shades of green and bronze ink. 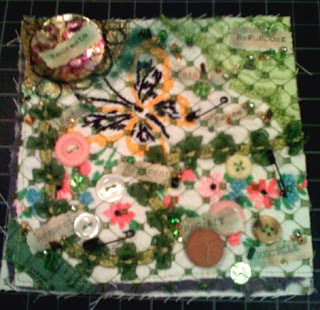 The embellishments are all goodies from my studio, vintage/antique lace, buttons from my button jar, beads, roving, & ribbon. The large green lace in the upper corner was cut off one of my twin daughters old dresses that I made a few years ago. The other corner is made from a recycled, painted then melted used Tyvek envelope, free motion stitched for texture then a shell button was hand sewn to the top. My two favorite parts of this piece are the covered buttons that were from my nana’s sewing basket and the green vintage hat netting. I positioned the pieces askew before quilting so that the layers would be visible. 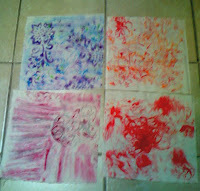 I liked the color and texture of the dryer lint, I think it “frames” the quilted square. I used wood textured fabric for the background then added purple tree batik, orange batik and purple and orange leaves fabrics. The upper right hand corner is a tree made from a branch from the offending tree and falling buttons for leaves. The quilt is small so you probably can't read what it says. "If a Tree Falls on a car and no one hears is does it make a noise?...Not sure but is sure does make a dent." "Was it the tree or a 500 pound bird that sat on the car?" The little quilt hangs from a bundle of branches from the fallen tree. I have been working on my altered art apron all day. My fingers hurt from seam ripping and sewing. It started out as one thing in my mind and has totally morphed into something else. One of the fabrics I want to use are these lady flowers. Figured it would be fun to see what flower I am so I took the quiz. "You are just a little bit of a show off and like to prove just what you can do. Every time someone double-dog-dared you, you proved that not only could you do it, but you could do it with style." What to know your Fairy Name? My name is Gossamer Willowwich. Despite my creative mission this year to focus on "RePurposed" art, I have never considered myself a tree hugger until today. 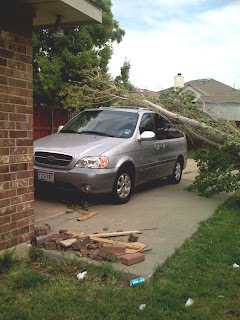 Upon returning from lunch with my husband I found my neighbors tree "hugging" my car. Not sure how this experience will reflect in this weeks journal quilt? Maybe I will save a piece of the cut up tree and add it somehow. I guess I have to choice but to spend time in the studio now, I literally can't go anywhere else! 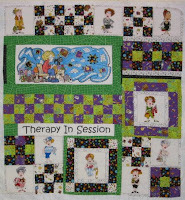 I won 3rd place for my "Therapy in Session" quilt. The challenge was that we were to make a quilt from fabrics purchased from Quiltmakers of Dallas using the 9 Patch Pizzazz Pattern. I used my prize money to buy more fabric. Can we ever have too much fabric? Made 100% from vintage fabrics. The little pink envelopes were made from scraps of pink fur fabric that came from an estate sale a few years ago. The fabric on the cards came from that estate sale and from ties from salvation army. Fall Mixed Media charms I made to exchange. Each charm was hand sewn with a variety of materials. Most were wrapped in wire and beaded. I made these stamped gourds to exchange with the Dallas Stampers. I won first place for my tea party hat. My hat came from goodwill and was decorated with flowers that came from salvation army. Also added to the hat was a butterfly clip and some feathers from Michael's craft store. 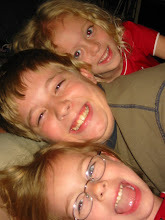 This was my first tea party to attend. Oh how fun! We played quilt bingo, ate tiny sandwiches and cakes, drank tea and chit chat-ed. Art Card Ideas 2007 Challenge. I submitted Thread Painting, Hot Texas Sun and Dream postcards to the 2007 postcard challenge. Michael Miller Fabric Paper fortune cookies. I made these for a trade for the Dallas Stampers Group. If you have not tried Michael Miller Fabric Paper you MUST! Last year at the Martha Pullen Market in Arlington Texas one of the available classes was on using this new product. Well it's probably not a new product, its just new to me. The fabric paper is awesome to work with. It has all the properties of both paper and fabric. You can cut it easily like paper and it holds shape easily. While at the same time can be sewn and monogrammed like fabric. Dream Mixed Media tags I made to exchange with fiber arts traders. These looked really cool in person. Each tag had little plastic like bubbles that were a "happy" accident. I used crackle paint over the layers of blue and violet paint. Of course I did not have the patience for the crackle paint to dry so I got out the ole trusty heat gun and gave it a blast of heat. The crackle bubbled up and hardened it looked sooooo cool! Yes, my kitchen walls are really that yellow! My March journal quilt was made from batik fabric scraps from a larger quilt that I have been working on and from wool, yarn, silk fibers and beads. I wanted to make a hot Texas sun to look at since I am taking some medication for the next 6 months and have to completely stay out of the sun. I thought the blue, yellow and orange batiks made the quilt have a summer sky effect. 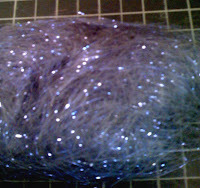 After the sun was felted together, I hand beaded "rays" to extend from the center to the outer edges of the wool rays. I had this quilt all finished and ready to label. I asked Drew (my son) what he thought of the name "forbidden sun". He told me it was a nice name but why would I call my sunflower a sun. 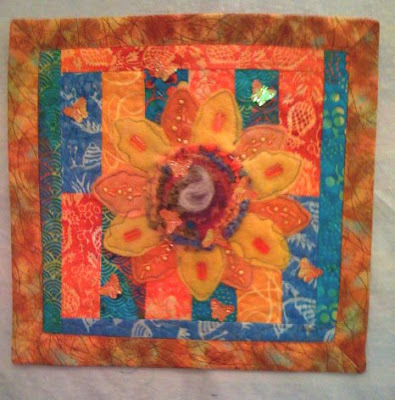 So, some butterflies where added and now the March journal quilt is known as "Drew's Sunflower". I have it hanging in our hallway that we painted orange marmalade. I wish the photo was more clear. The pins look so much prettier in person. 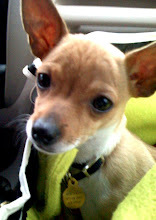 Each was made from tiny little shamrock fabric fixed to a piece of fast-2-fuse. 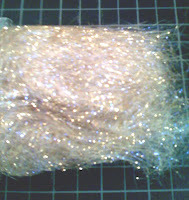 Then several different strands of decorative threads and yarns were added then tons of beads were hand sewn on. This was a really fun exchange. We each made an inchie VIP Queen pin for another person. Our trade partner emailed us a photo of themselves so we could incorporate it into our art pins. I received the AWESOME Gold and Red Inchie Queen Pin from my friend Edna and I made her the Pink Fairy Princess Inchie pin. I embellished her pin with little bells, gold wings, crown and princess dress. 6 Dorset buttons I made to exchange. Each is embellished with either beads, charms, wings. A really fun exchange. I had never heard of making these buttons before. Two felted puzzle pieces I made for exchange. Fiber Art Traders Dottie Doll Exchange dolls that I made. 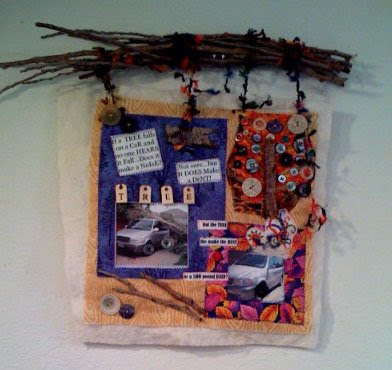 About a month after actively participating in Fiber Art Traders I received a group email posted by the list owner Norma Jean that Quilting Arts Magazine wanted to host an "Inchie" exchange at the 2007 Houston Quilt Show. 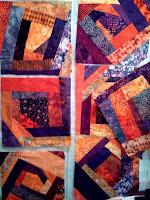 In addition to hosting the inchie trade Quilting Arts Magazine issued a challenge to our group to see what items we could create using "Inchies" for possible inclusion in their exhibit at the Houston Quilt Show. I even snuck a photo...big no, no, but I have not posted it anywhere...it was just for me to look. 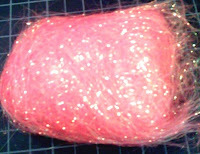 My first trade with Fiber Art Traders was this eye mask. It was a 1-1 trade where we could make one eye mask and then someone would trade with us. I made my mask from a shear variegated color fabric. I placed it over a piece of organic cotton batting and then thread painted an sun like looking eyes with opposite colors on each side. I finished the mask off by laying a ribbon across the mask, they layered with a soft cotton fabric, stitching right sides together then turning right sides out. I top stitched yarn on to embellish the edges. I was invited to join a Stampin Up group by my friends Mary(#1) and Suzy. We meet once a month on a Friday night at Mary (#2) house. Each month Mary (#2) has three projects for use to make. They are so creative, I wonder how she is able to come up with so many wonderufl ideas. I'll ask her if its okay to post photo of the goodies we make. Our Stampin up group has a card exchange every other month. We each agreed to make 12 cards (one for each person in the group) with Stampin up products. I am new to the group (many of the ladies have been stamping for years) so my cards are not even close to the wonderful cards made by the other ladies in the group. I figure that practice will make...better...not even hoping for perfect. This is our second trade. My 12 cards were made with some cute dog stamps colored in with the stampin up blender pens (LOVE THEM), mulberry papers. and some charming dog bone paperclips.